Although hyperphosphatemia is a risk factor for mortality, there are limited data on whether therapy with phosphorus binders affects survival. We analyzed a prospective cohort study of 10,044 incident hemodialysis patients using Cox proportional hazards analyses to compare 1-yr all-cause mortality among patients who were or were not treated with phosphorus binders. We performed intention-to-treat analyses to compare patients who began treatment with phosphorus binders during the first 90 d after initiating hemodialysis (n = 3555) with those who remained untreated during that period (n = 5055). We also performed as-treated analyses that modeled phosphorus binder treatment as a time-dependent exposure. We compared survival in a subcohort of treated (n = 3186) and untreated (n = 3186) patients matched by their baseline serum phosphate levels and propensity score of receiving phosphorus binders during the first 90 d. One-year mortality was 191 deaths/1000 patient-years at risk. Treatment with phosphorus binders was independently associated with decreased mortality compared with no treatment in the intention-to-treat, as-treated, and matched analyses. The results were independent of baseline and follow-up serum phosphate levels and persisted in analyses that excluded deaths during the first 90 d of hemodialysis. In summary, treatment with phosphorus binders is independently associated with improved survival among incident hemodialysis patients. Although confirmatory studies are needed in the dialysis setting, future placebo-controlled, randomized trials of phosphorus binders might focus on predialysis patients with chronic kidney disease and normal serum phosphate levels. The evidence linking hyperphosphatemia with adverse outcomes suggests that lowering serum phosphate levels in individual dialysis patients will improve their clinical outcomes, but no interventional or even observational studies have examined the impact of serum phosphate reduction on survival. Furthermore, all of the phosphorus binders used in clinical practice were approved by the Food and Drug Administration on the basis of their efficacy in lowering serum phosphate levels in short-term studies of dialysis patients.11–14 No placebo-controlled studies have examined the impact of treatment with phosphorus binders on hard clinical end points, including survival. Indeed, although several studies aimed to determine which specific phosphorus binder is best for dialysis patients,15,16 there are no data on whether any phosphorus binder treatment versus none alters clinical outcomes. We analyzed a prospective cohort study of incident hemodialysis patients to test the hypothesis that therapy with any phosphorus binder versus none is associated with a survival benefit. Comparisons of baseline characteristics of patients who were treated versus those who were untreated with phosphorus binders during the first 90 d after initiating outpatient hemodialysis are presented in Table 1. In the unmatched cohort, treated patients were younger; had higher BP, body mass index, serum phosphate, parathyroid hormone (PTH), and creatinine levels; and were more likely to have a fistula for vascular access. There were no differences in gender; race; or albumin, creatinine, or hemoglobin levels. With the exception of small residual differences in age, all other differences in baseline characteristics among treated and untreated patients were eliminated in the propensity score–matched cohort (Table 1). The 1-yr mortality rate was 191 deaths/1000 patient-years at risk in the unmatched cohort. The phosphorus binder–treated group had a significantly lower mortality rate than the untreated group in the unmatched cohort (136 versus 235 deaths/1000 patient-years at risk; relative risk 0.58; 95% confidence interval [CI] 0.52 to 0.66; P < 0.0001). The results of the univariate and multivariable-adjusted survival analyses are presented in Table 2. In both the intention-to-treat and the as-treated analyses, phosphorus binders were independently associated with a significant survival benefit, the magnitude of which ranged between 18 and 30% in multivariable models and were unaltered by further adjustment for administration of intravenous active vitamin D during the follow-up period or in facility-specific stratified analyses. The results were qualitatively unchanged in a prespecified analysis that excluded patients who died during the first 90 d after initiating hemodialysis (hazard ratio [HR] 0.82; 95% CI 0.70 to 0.95; P = 0.01) and in analyses that incrementally excluded patients who died during consecutive 15-d intervals between days 0 and 90 (HR ranging between 0.74 and 0.85; all P < 0.05). In analogous models, no significant survival effect was associated with aspirin (HR 0.98; 95% CI 0.78 to 1.23; P = 0.86) or angiotensin-converting enzyme inhibitors (HR 0.84; 95% CI 0.68 to 1.04; P = 0.11), whereas the association between phosphorus binders and survival persisted unchanged in a model that adjusted for these comparator medications (HR 0.71; 95% CI 0.60 to 0.85; P < 0.0001). Phosphorus binder therapy was associated with a significant survival benefit in many but not all strata, whereas lack of treatment was favored in no stratum (Figure 1). Formal testing for interaction revealed effect modification only by Hispanic ethnicity (P = 0.01), which was associated with a greater benefit from binders than non-Hispanic ethnicity. 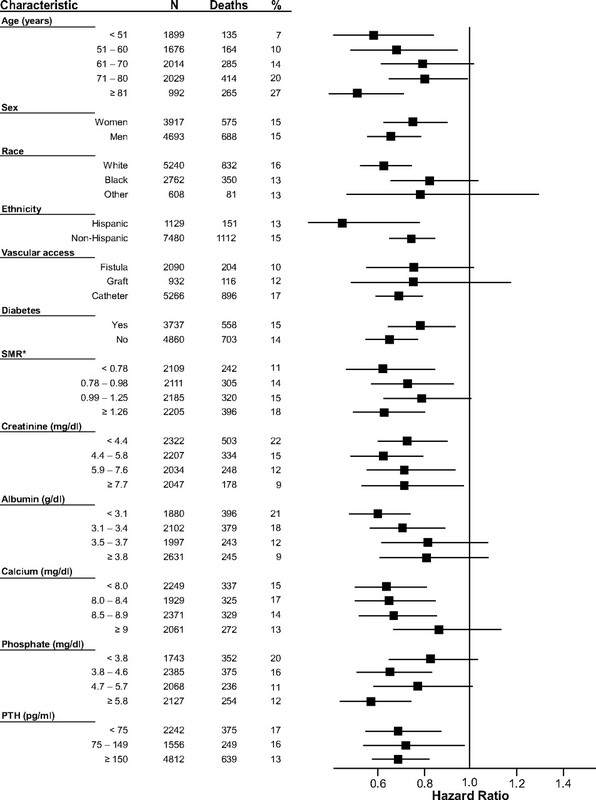 The multivariable-adjusted benefit of phosphorus binders was somewhat greater for cardiovascular-specific mortality (HR 0.67; 95% CI 0.57 to 0.79; P < 0.0001) than for death from other causes (HR 0.73; 95% CI 0.60 to 0.89; P = 0.002), but there was significant overlap in the CIs. Stratified HRs for mortality in the unmatched subcohort (n = 8610) comparing patients who began treatment with phosphorus binders during the first 90 d on hemodialysis versus those who were not treated during the first 90 d. Models within individual strata were adjusted for all other covariates, including age; gender; race; ethnicity; cause of renal failure; systolic BP; body mass index; standardized mortality rate; initial vascular access; coronary artery disease; congestive heart failure; laboratory variables including albumin, creatinine, calcium, phosphate, PTH, and hemoglobin; and vitamin D therapy at baseline. Percentages represent the proportion of deaths within each stratum, squares represent the HR point estimates, and horizontal lines represent 95% CIs. Point estimates to the left of unity (vertical line) favor a survival benefit of phosphorus binders. Phosphorus binder treatment was associated with a significant survival advantage in the propensity score–matched cohort (HR 0.75; 95% CI 0.66 to 0.87; P < 0.0001; Figure 2A); the results were unchanged when adjusted for the residual difference in age (Table 3). In addition, phosphorus binder treatment was associated with a significant survival advantage in each quartile of baseline serum phosphate except the lowest (Figure 2, B through E; Table 3). Furthermore, the magnitude of the point estimate of phosphorus binders was minimally attenuated when the results were further adjusted for follow-up serum phosphate levels (Table 3). (A through E) Survival of treated and untreated patients in the overall propensity score–matched cohort (A) and according to quartiles of baseline serum phosphate: <3.7 mg/dl (B), 3.7 to 4.5 mg/dl (C), 4.6 to 5.5 mg/dl (D), and ≥5.6 mg/dl (E). Finally, we examined the outcomes of the 1434 patients who had begun treatment with phosphorus binders before the initiation of hemodialysis and were excluded from the previous analyses. These patients demonstrated a significant survival advantage compared with the 5055 patients who were untreated in the first 90 d (the control group in previous analyses; HR 0.74; 95% CI 0.61 to 0.88; P = 0.0008), and even when compared with all 8610 patients used in the intention-to-treat analyses (HR 0.83; 95% CI 0.70 to 0.98; P = 0.03), which included the 3555 who were treated during the first 90 d.
In this 1-yr prospective observational study of incident hemodialysis patients, treatment with phosphorus binders was associated with a significant survival advantage compared with no treatment. The benefit of phosphorus binders was independent of established risk factors, consistent across a variety of subgroups, and robust to different analytic strategies. Interestingly, we observed a survival benefit of phosphorus binders in each of the three upper quartiles of baseline serum phosphate, a group that spanned many patients for whom therapy is not currently recommended because their phosphate levels were not above the target range for dialysis patients.9 Furthermore, although phosphorus binders are approved for lowering serum phosphate levels, the survival benefit of therapy was only minimally attenuated when adjusted for follow-up phosphate levels. Collectively, these results suggest potential benefits of phosphorus binders beyond reduction of serum phosphate levels that, if verified by other studies, would justify further exploration into potential mechanisms and perhaps support a broader role for phosphorus binder therapy in patients with chronic kidney disease. Elevated serum phosphate levels are independently associated with mortality in hemodialysis, predialysis, and non–kidney disease populations.1–7 Although the mechanisms are incompletely understood, hyperphosphatemia is linked to nonatherosclerotic arterial calcification, increased arterial stiffness, and left ventricular hypertrophy, each of which is an independent risk factor for death.17–21 Calcium acetate and carbonate are phosphorus binders that are widely used to treat hyperphosphatemia on dialysis, but some experts have questioned their long-term safety because excessive calcium loading may exacerbate arterial calcification.3 As a result, a number of studies explored differences in outcomes according to whether patients were treated with calcium- or newer non–calcium-based binders. Although the results of these studies have been mostly inconsistent with some but not all suggesting differences in cardiovascular surrogates and mortality according to specific binder classes,22–25 until now, no studies examined the more fundamental question of whether treatment with any phosphorus binders versus none affects survival. Lowering serum phosphate levels is an obvious mechanism through which phosphorus binders might be associated with a survival advantage, but the benefit we observed was independent of baseline and follow-up serum phosphate levels, suggesting additional protective mechanisms. An intriguing possibility is the effect of phosphorus binders on circulating levels of fibroblast growth factor 23 (FGF-23). FGF-23 is a hormone that regulates serum phosphate levels by modulating urinary phosphate excretion and 1,25-dihydroxyvitamin D synthesis in the kidney.26 Patients with chronic kidney disease develop progressive increases in FGF-23 levels that often reach 100-fold above normal once they initiate dialysis.27 Although increased FGF-23 levels are thought to represent a compensatory mechanism to maintain normophosphatemia in the face of declining nephron mass, increased FGF-23 levels were independently associated with increased risk for mortality in a dosage-dependent manner in a recent prospective study of incident hemodialysis patients.27 Importantly, the association between increased FGF-23 levels and mortality was independent of serum phosphate levels, paralleling the results in this study. Given that phosphorus binders lower FGF-23 levels,28,29 it is interesting to speculate that the benefit of binders that we observed might be mediated by attenuating potential toxicity of markedly increased FGF-23 levels in patients with only mild or even no increase in serum phosphate levels. Serum phosphate levels increase with duration of dialysis.1 Thus, a strength of this study was the large sample of incident hemodialysis patients that enabled us to study those with relatively low serum phosphate levels, many of whom were and were not treated with phosphorus binders. Had we studied prevalent patients, higher serum phosphate levels would have resulted in fewer untreated patients and increased the likelihood of selection bias. Furthermore, combining incident and prevalent patients would have introduced immortal time bias30 given that prevalent patients would have had greater opportunity to survive long enough to receive phosphorus binders than incident patients because early mortality on dialysis is common.31 Another benefit of the large sample of incident patients with detailed covariate data was the ability to perform well-powered propensity score–matched analyses, which minimize selection bias and confounding by indication by matching treated and untreated patients on their probability of being treated as a function of their baseline characteristics.32 The effect of phosphorus binders on survival was consistent in these analyses, which suggests that the results were unlikely to be due to selection bias. We must be cautious, however, because, unlike randomized trials, propensity score matching can balance only known confounders; we cannot exclude residual confounding by unmeasured confounders. Indeed, although our study design and multiple analytical approaches aimed to approximate a randomized trial, no single analysis could eliminate all potential sources of bias as an actual trial would. Thus, we must rely on the totality of the results and their qualitative consistency across different analytical strategies as the primary finding of this observational study. This study has additional limitations. Phosphorus binder use was ascertained on the basis of its prescription, and although the percentage of patients who were prescribed these agents before and within 90 d of initiating dialysis was consistent with previous reports,33 we did not have direct measures of compliance, such as pill counts, and we were unable to study dosage of therapy; however, noncompliance in the treated group and underascertainment of binder use in the untreated group would tend to bias the results to the null because the treated group would include patients who were actually untreated and the untreated group would include some patients who were. Furthermore, a benefit of binders was detectable regardless of treatment status with other oral and intravenous medications, suggesting that differential ascertainment did not account for the results. Second, there was a relatively high rate of censoring. Although this did not differ by binder treatment group and informative censoring is unlikely, there may have been potential differences between the comparison groups after loss of follow-up. Third, the duration of follow-up was relatively short, which may be a limitation because clinical outcomes related to certain binder types might be modified by duration of treatment beyond the first year.24 Finally, like other large dialysis cohorts, we did not have information on dietary phosphorus intake, which would have been especially important to explore the observation that Hispanic patients derived a greater survival advantage than non-Hispanic patients. Further studies are needed to determine whether differences in phosphorus intake modify the survival benefit of phosphate binders and whether the effect in Hispanic patients is reproducible or an artifact of multiple subgroup analyses. In contrast, a placebo-controlled, randomized trial would be most feasible in the very population in whom the greatest public health impact of phosphorus binders may be derived: patients with predialysis chronic kidney disease and normal serum phosphate levels. These patients number in the millions in the United States alone,35 have alarmingly high mortality rates,36 and have abnormal phosphate metabolism marked by high FGF-23 levels26; however, because >90% of these patients maintain normal serum phosphate levels,26 they are rarely treated with phosphorus binders on the basis of current indications. A randomized trial of binders versus placebo to decrease mortality in patients with stages 3 and 4 chronic kidney disease and normal serum phosphate levels is feasible, would validate or cast doubt on the results of this study, and, if positive, would dramatically alter the treatment of patients with kidney disease worldwide. Accelerated Mortality on Renal Replacement (ArMORR) is a prospective cohort study of 10,044 patients who initiated long-term hemodialysis at any of 1056 US hemodialysis centers operated by Fresenius Medical Care, North America (Lexington, MA) between July 2004 and June 2005. Data were collected prospectively by individual patients’ practitioners at the point of care and included demographics; comorbidities; medications such as phosphorus binders, activated vitamin D, and cardiovascular drugs; routine laboratory results performed by a central laboratory (Spectra East, Rockland, NJ); and outcomes. Longitudinal follow-up was continued through patients’ first year on hemodialysis. Home medications were ascertained at baseline and monthly thereafter through patients’ verbal report; new prescriptions of dialysis-related medications such as phosphorus binders and activated vitamin D were entered into the database at the time of prescription. For data quality assurance, patients brought their pill bottles to the facility to verify the accuracy of the medication list in the database on a quarterly basis. Laboratory results obtained at the initiation of hemodialysis included albumin, creatinine, calcium, phosphate, and hemoglobin, which were measured using standard multisample automated analyzers, and PTH, which was measured using Nichols Bio-intact assay of full-length 1-84 PTH. The study was approved by the institutional review board of the Massachusetts General Hospital, which waived the need for informed consent because all clinical data were stripped of personal identifiers before transfer to the investigators. The primary outcome was all-cause mortality during the first year of hemodialysis, confirmed by mandatory discharge diagnosis reports from individual hemodialysis centers. We also examined cardiovascular and noncardiovascular mortality using International Classification of Diseases, Ninth Revision mortality codes, as done previously.37 The primary exposure was any therapy with dietary phosphorus binders. We chose not to study specific phosphorus binder types because patients were often treated with different classes of binders at different time points often in combinations and because comparisons of specific binders were the focus of previous randomized trials,22–25 whereas no studies have compared any therapy versus none. Certain basic laboratory tests are performed monthly on all dialysis patients, but serum phosphate levels can be measured more frequently when medications such as phosphorus binders are being actively titrated; therefore, we examined the frequency of additional testing of serum phosphate levels beyond the standard monthly measures as a method of validating the ascertainment of phosphorus binder therapy in ArMORR. In support of the accuracy of the primary exposure, patients who were noted as being treated with phosphorus binders had a 50% higher number of extra serum phosphate measurements than those who were noted to be untreated (P < 0.0001). We classified patients into three groups according to their exposure to phosphorus binders: (1) pretreated: those who had begun therapy before initiating hemodialysis and, thus, before enrollment in ArMORR (n = 1434); (2) treated: those who began treatment during the first 90 d after initiating hemodialysis (n = 3555); and (3) untreated: those who were untreated during the first 90 d (n = 5055). In an effort to mimic a randomized trial, we performed an intention-to-treat analysis of the treated and untreated groups (n = 8610) in which patients who did not take binders during the first 90 d were analyzed in the untreated group regardless of subsequent “crossover” to treatment, whereas those who discontinued therapy at any time after it was begun during the first 90 d remained in the treated group. We also conducted as-treated analyses in which survival time before therapy began was credited to the untreated group and only after therapy began was subsequent survival time credited to the treated group. Like the intention-to-treat analyses, once patients initiated phosphorus binders, they remained in the treated group for the remainder of their follow-up time until death or censoring. The pretreated group was excluded from these analyses to reduce selection bias and because we could not adjust for covariates measured at the time the decision was made to initiate phosphorus binders in that group because this occurred before the initiation of hemodialysis when ArMORR commenced. In an effort to minimize potential selection bias and confounding by indication in this observational study, we performed additional analyses after calculating a propensity score of likelihood of receiving phosphorus binders using logistic regression.32 Baseline predictors that are clinically related to phosphorus binder use were used to estimate the propensity score and included age, gender, race and ethnicity (ascertained via self-report); BP; body mass index; cause of renal failure; albumin, creatinine, calcium, phosphate, PTH, and hemoglobin levels; history of coronary artery disease and congestive heart failure; hemodialysis access; and baseline use of activated vitamin D. To account for local differences in overall quality of care, we also included individual hemodialysis units’ standardized mortality rates in the propensity score estimation.38 An investigator (Y.C.) who was blinded to outcomes used the propensity score to generate a subcohort of 3186 pairs of treated and untreated patients who were matched one-to-one by propensity score ±0.03, as has been done previously.39 These patients were also matched by baseline serum phosphate quartile to ensure that the propensity score–matched pairs remained intact for prespecified stratified analyses within each phosphate quartile. We used two-sample t, Wilcoxon rank sum, and χ2 tests to compare baseline characteristics and laboratory results according to the phosphorus binder treatment groups in both the unmatched and matched cohorts. After confirming the proportionality assumption, we used Cox proportional hazards analyses to examine the crude and multivariable-adjusted risk for mortality associated with phosphorus binder therapy in the unmatched cohort, censoring at the time of kidney transplantation (3%), spontaneous recovery of renal function (4%), or transfer out of the Fresenius Medical Care system (12%) that occurred before completing the 1-yr of follow-up. There was no difference in the frequency of censoring between the treated and untreated groups (18.6 versus 19.6%; P = 0.27). The multivariable analyses included the same covariates used to calculate the propensity score. We tested for interaction between phosphorus binder therapy and demographic and laboratory characteristics and report stratum-specific HRs in the unmatched cohort. Treatment with activated vitamin D has been associated with improved survival on hemodialysis,37 and phosphorus binders could alter serum levels of calcium, phosphate, and PTH and thereby influence the decision to administer vitamin D; therefore, we also adjusted for the use of vitamin D therapy during the follow-up period as a time-dependent covariate. To account for differences in quality of care at different dialysis units, we analyzed models stratified by facility-specific standardized mortality rate. Because the matching strategy eliminated virtually all differences in baseline characteristics between the treated and untreated groups, we compared their survival in the matched cohort using Kaplan-Meier curves, as has been done previously,40 with Cox models used to adjust for residual differences in age. To explore whether the effect of phosphorus binders on survival was altered by changes in follow-up serum phosphate levels, we examined the change in point estimate for binder treatment in models that included the quarterly mean of follow-up serum phosphate levels modeled as time-varying covariates. To test whether the results were robust to early mortality on dialysis, we repeated the intention-to-treat analyses in the unmatched cohort after excluding patients who died during the first 90 d of initiating hemodialysis in a prespecified subgroup analysis and performed additional sensitivity analyses that incrementally excluded deaths that occurred during the 15-d intervals from the initiation of dialysis through day 90. In addition, we tested the specificity of the phosphorus binder effect by examining the associations between aspirin and angiotensin-converting enzyme inhibitors and survival in multivariable models. Finally, we compared the survival of the previously excluded pretreated patients (those who began binders before initiating dialysis) with that of the treated and untreated groups. Analyses were performed using SAS 9.1 (SAS Institute, Cary, NC). Two-sided P < 0.05 was considered statistically significant. M.W. has received research support from Shire and honoraria from Genzyme and Ineos. R.T. has received honoraria from Genzyme. The overall ArMORR study was supported by a seed grant from Abbott Laboratories and grant R21DK071674 (R.T.) from the National Institutes of Health. This study was supported by grants from the American Kidney Fund Clinical Scientist in Nephrology Fellowship (T.I., and O.M.G. ); the Center for D-receptor Activation Research (CeDAR) at the Massachusetts General Hospital; and grants K30RR02229207, K23RR017376 (M.W. ), and RO1DK076116 (M.W.) from the National Institutes of Health. See related editorial, “Phosphorus and Survival: Key Questions That Need Answers,” on pages 234–236.